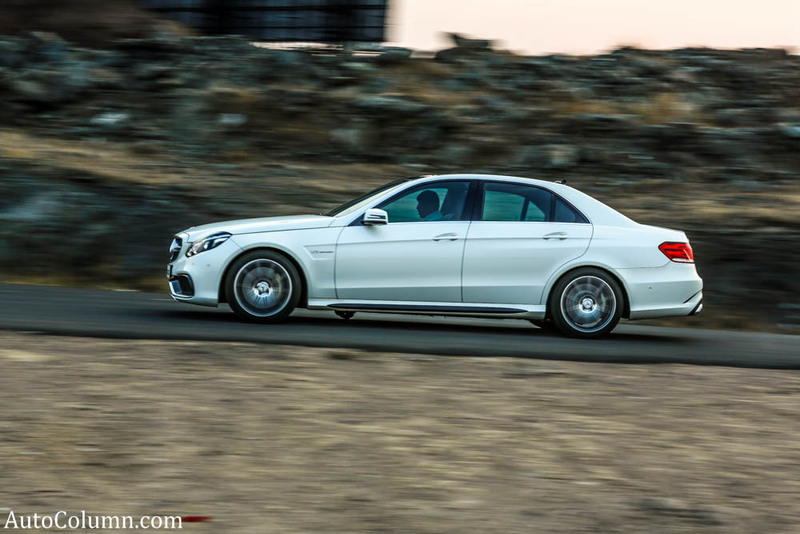 Team AutoColumn reviews 2014 Mercedes Benz E63 AMG sedan. The race of getting numbers in terms of volume sales is always good when it comes to luxury car manufactuers. 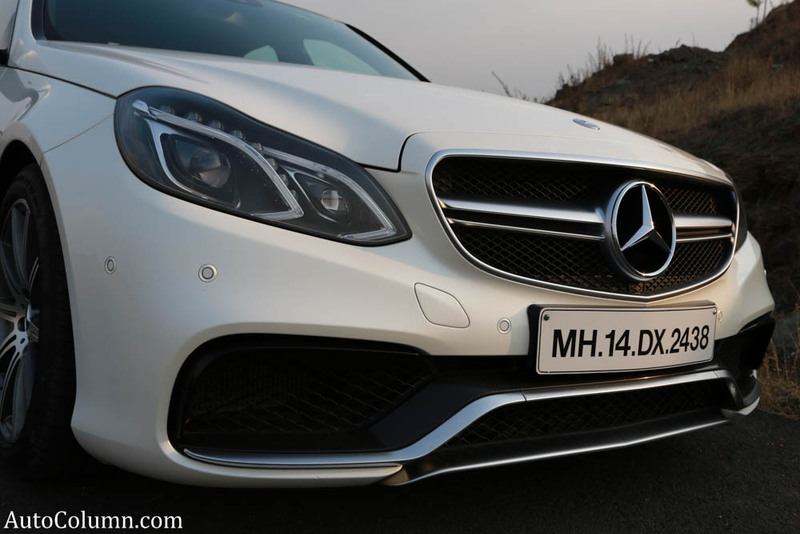 The race of Indian luxury car is dominated by the German Audi, BMW and Mercedes-Benz. 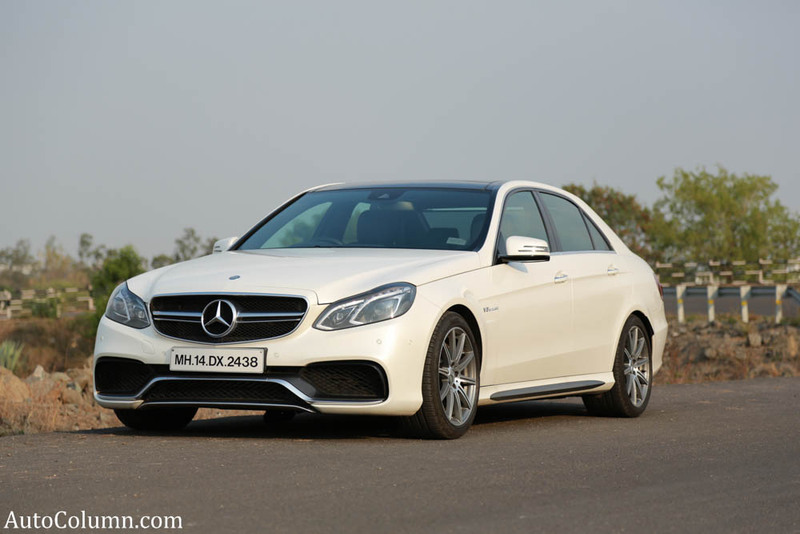 Just a month after launch of all new E-Class, Mercedes-Benz launched 2014 E63 AMG sedan in India at a price of 1.29Cr. The product is head on competition to BMW’s M5. 4 door sedan with a literally race car engine powering rear wheels of the car. What else an enthusiast can expect? A chance to get behind the wheels of such a performance and luxury product. A car that can accommodate easily 4 people with comfortable ride and when the driver wants to go a little quick to 3 digit speeds, he/she is just inches away from the peddle to metal. 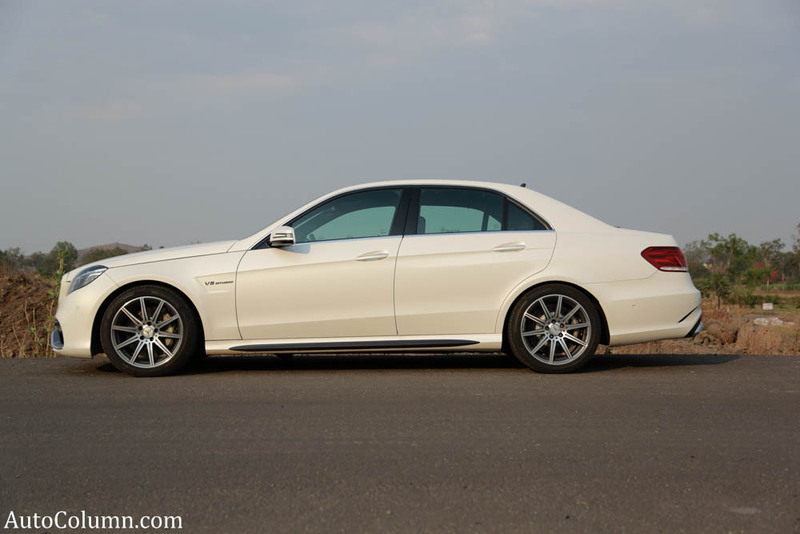 Team AutoColumn reviewed 2014 Mercedes Benz E63 AMG and we drove it enough for 200 kms to understand rightly the behavior of the beast in the city, on the highway and on curvy roads. 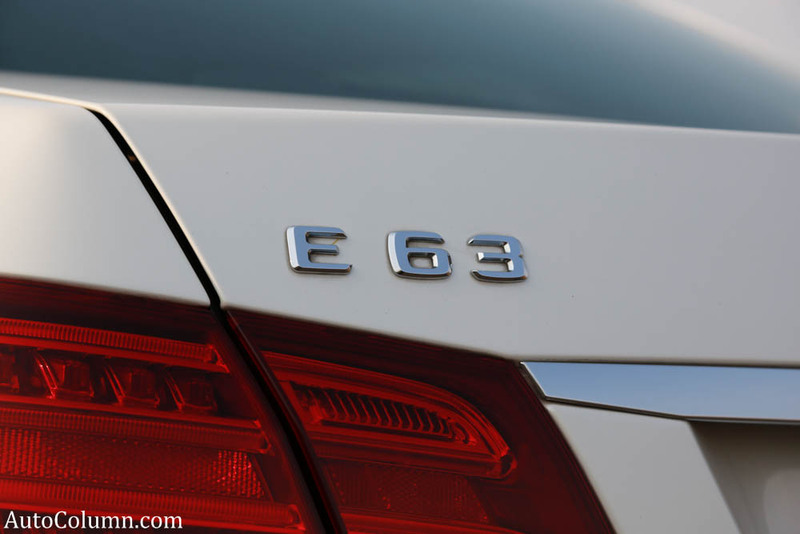 2014 E63 AMG gets amount of E-Class as much as it has the letter ‘E’ in its name. The distinctive bumper in the front with huge carbon fibre apron accompanying huge airdams is the first attraction in this AMG. The Carbon fiber lined by aluminium inserts makes the car look sharp at front. Front grille is now with single blade incorporating tristar in between and it is evident from the front design that everything is designed to take care for the heat produced by 5.5 lit V8 under the hood. Headlamps are same with all LED projector units and new parallel ‘V’ shaped DRLs make it look aggressive overall when looked from the front. 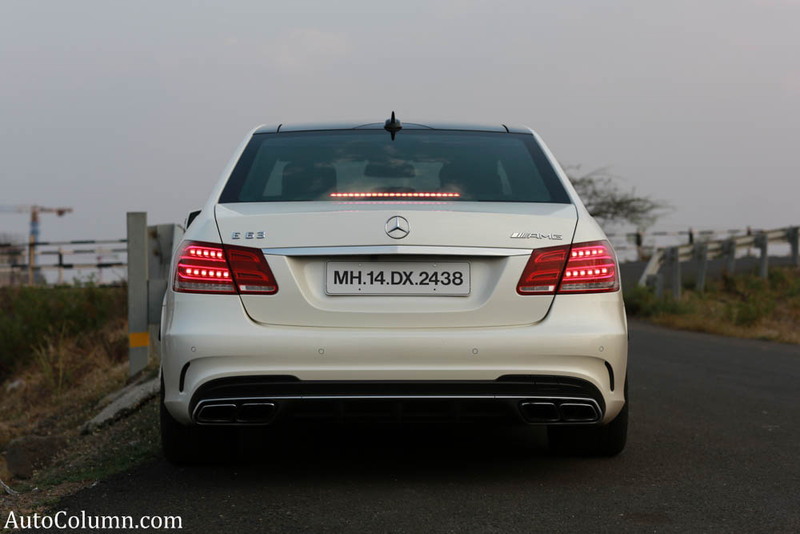 At the rear end, 4 quad titanium exhaust (with AMG badging) peek out from the carbon fiber inserts in the rear bumper. A tiny air-vent provided in the bumper is mainly to pass air which moves from the rear wheels of the car. 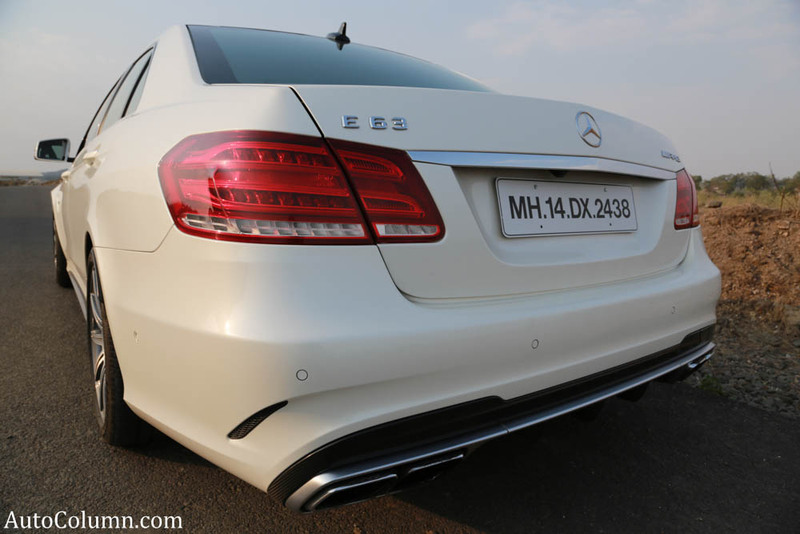 On the side profile, except front and rear bumpers, the metal body including doors remains complete E-Class. The distinctive addons here are the ‘V8 Biturbo’ mascot just after front wheel-arch and again carbon fiber equipped side skirts. 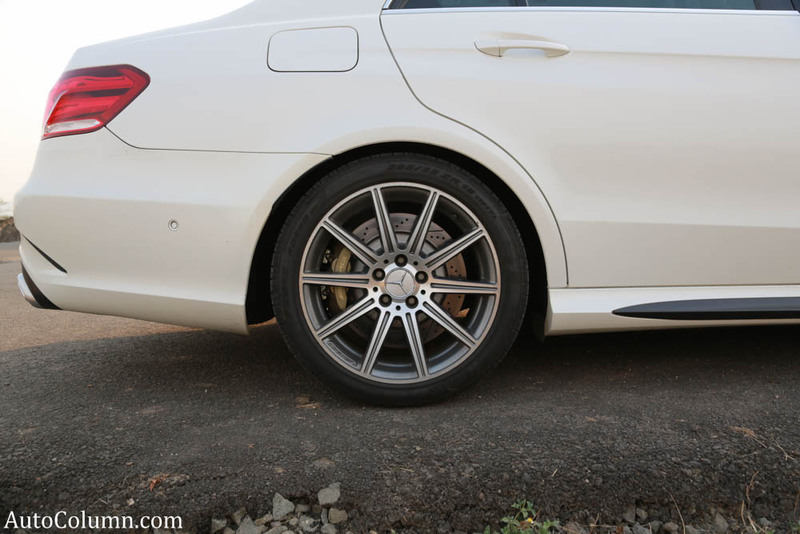 E 63 AMG is fitted as standard with 10-spoke AMG light-alloy wheels painted in titanium grey and featuring a high-sheen finish. Tyres in size 255/40 R 18 are fitted to 9.0 x 18 wheels at the front, while the 9.5 x 18 rear wheels have 285/35 R 18 tyres. The car design is not much whacky but it has ensured everything that is needed to take care of speeds the car can cater and to feel much safer and confident at high speeds. 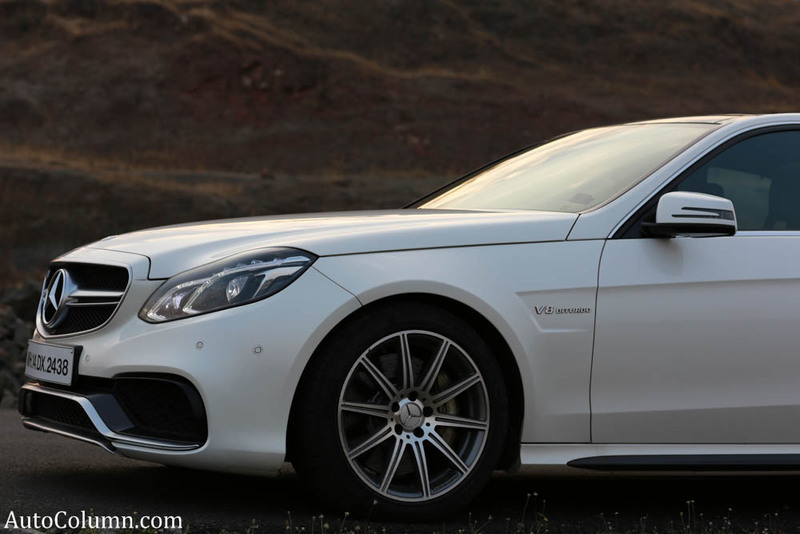 The side profile looks mere plain and feels a regular E-Class except side skirts. At blue hour when we looked at the car, the aggressive front look invited us to get in the cockpit and to have some serious driving fun. As we stepped in we found dashboard design very much like E-Class, the difference is a lot of carbon fiber again and piano black finish to interiors. The dark environment adds to the overall aggression mood. Aluminium finish inserts on dash reminds the driver that its a luxury sports sedan. The center console is a complete new unit and it incoporates the AMG functions at it lower part. 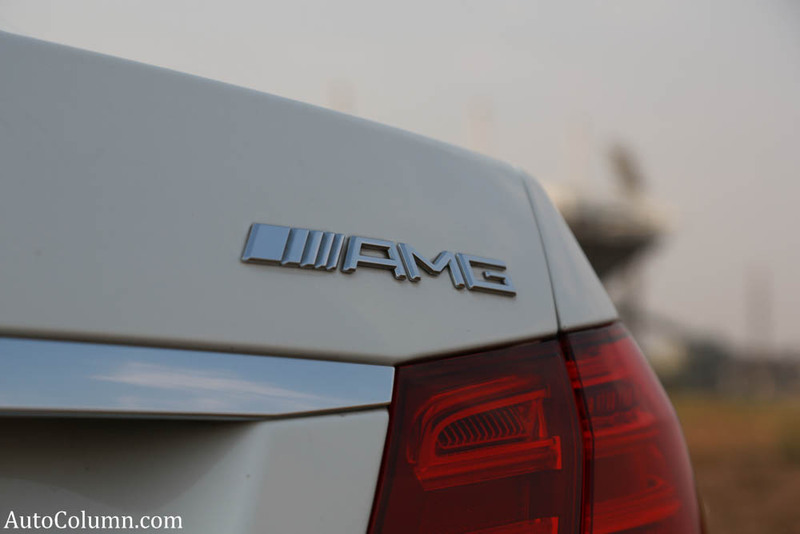 There is an array of 4 buttons with the AMG gear shifter. 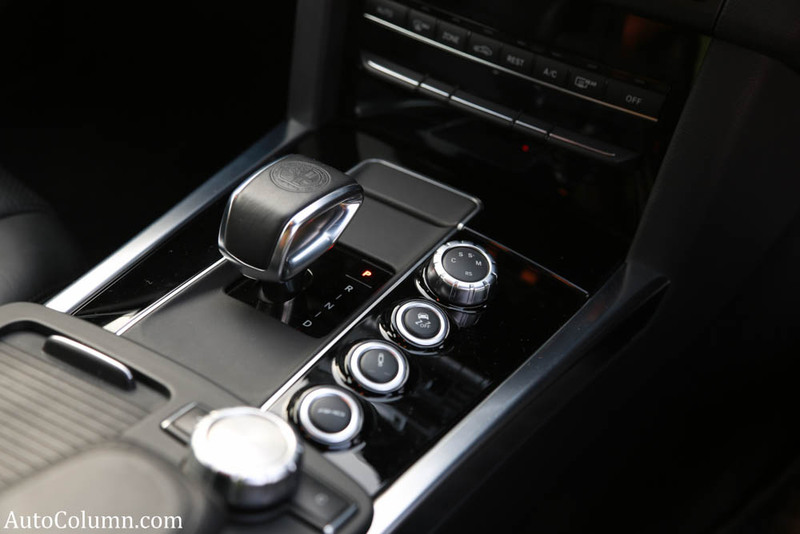 The gear shifter is wrapped in leather and that also gets AMG embossing. 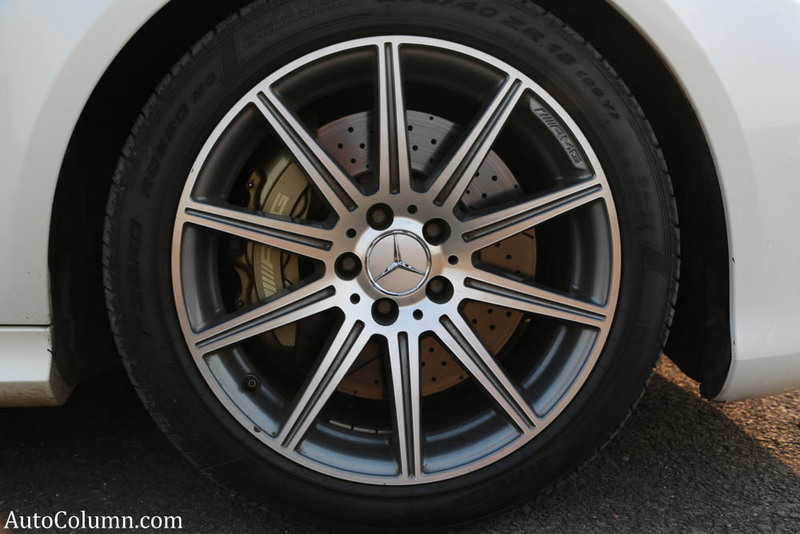 Attention to detail is fantastic in every Mercedes Benz car and so is done in E63 AMG too. Steering is leather wrapped with again aluminium-finished 3 spokes. Pedal shifters (the most exciting part) hides behind steering wheel. Carbon fiber inserts are also on door panel and it looks continuation of carbon fiber strips from dashboard and matches very well with the design. Though everything is black and has a touch of sporty, it feels a bit less exiciting till we found functions of front seats in this car. Driver and co-driver seats gets multiple adjustments settings with active bolsters which holds driver during agressive moves by supporting against the centrifugal force. This can be activated and de-activated with a flick of a button. The seats also get adjustments for lumbar support which can perfectly hold any height person and make him/her comfortable. 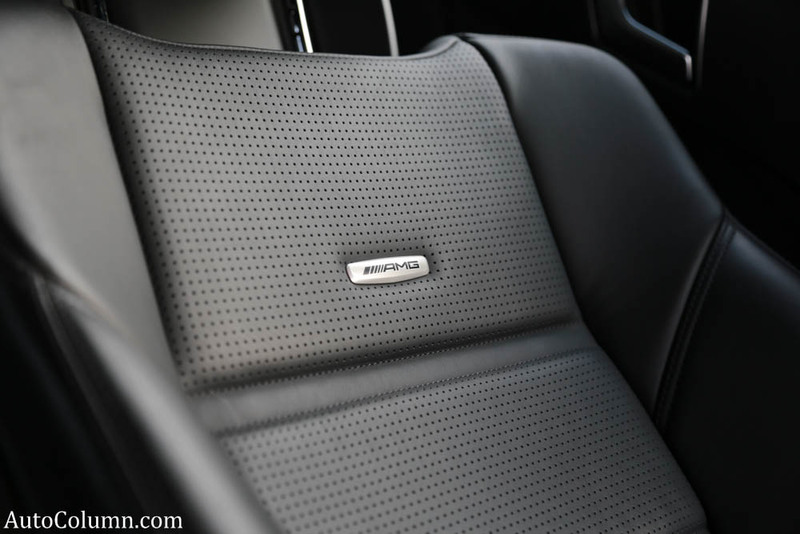 In addition to this, seats also get cooling and heating function. Rear seats get a display screen mounted at back of front seats to entertain themselves while the driver is having fun driving the car. 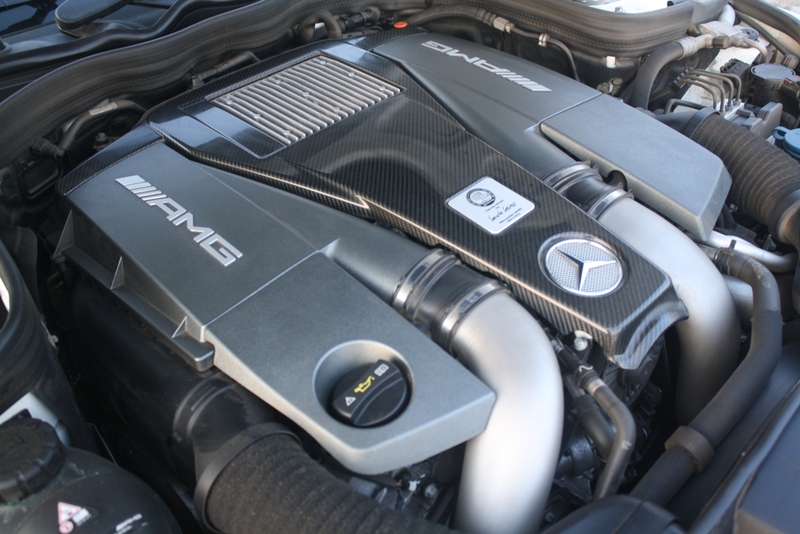 A 5.5 liter V8 biturbo is plonked under the hood of 2014 E63 AMG. The facts and figures of this engine output are just not the numbers but they do give a crazy real life experience which gives an evil grin on the face of the driver. The biturbo petrol engine pumps 557 bhp and 720 Nm of torque. All of this torque and power is transferred to rear wheels of the car and there are enough electronic systems to keep this car straight even when everything is bursting out from rear wheel at every turn the driver makes aggresively. 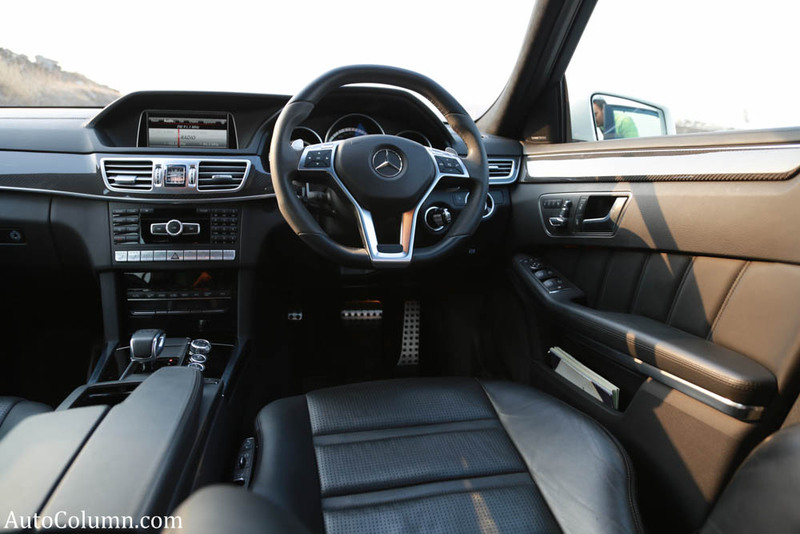 The refinement level of Mercedes Benz shows up when there is even thinking of how much sound should be audible inside car cabin of this V8 motor. At idle, the grunt of V8 is almost negligible but as soon as you revv in first few gears the roar is not too loud and not too low and its just perfect that comes to ears of commander. 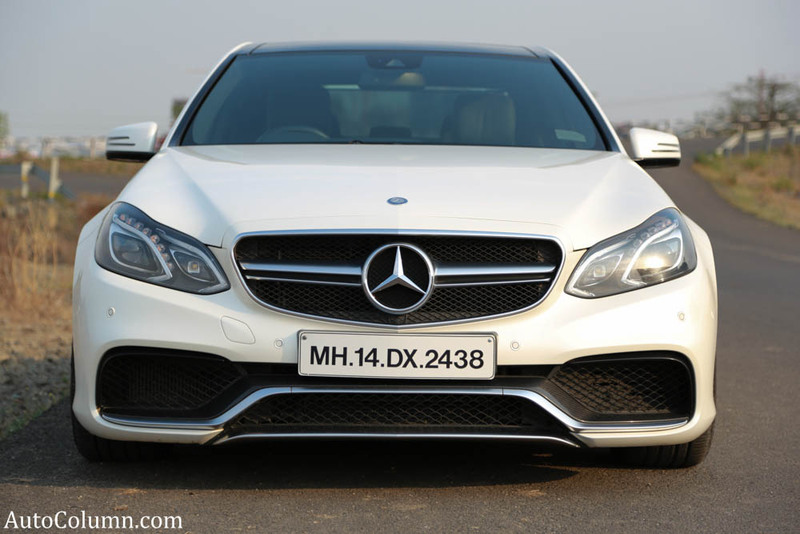 The engine is mated to AMG SPEEDSHIFT MCT 7-speed sports transmission that comes with 4 modes. The four modes – “C” (Controlled Efficiency), “S” (Sport), “S+” (Sport plus) and “M” (Manual) – offer the driver a personal set-up. In “C” mode, the ECO start/stop function is active and switches off the eight-cylinder engine when the vehicle is at a standstill. In addition, the transmission characteristics are tangibly soft, with smooth and early gear changes. Second gear is generally used as the starting gear in this mode. If you really want to enjoy soundtrack of this car, just roll all windows down and revv this beast hard. As the gear shift occours, there is a small amount of wheelspin that occours and then traction control takes over to get faster and faster to move toward another gear. We remembered NASCAR circuits aural bliss when we did this. The engine and transmission are far more agile in “S”, “S+” and “M” mode; in addition, the ECO start/stop function is deactivated. Partial suppression of the cylinders proves perfect for an emphatic driving style: briefly and precisely interrupting ignition and injection under full load leads to even faster gearshifts with a more emotional sound than before. The downshifts are audible and the ‘brupp brupp’ sound from the transmission is just awesome in sports mode. The best thing about this engine and gearbox is if you dont want to do spirited driving all the time the car in easily cruise at 100-120kmph on 7th gear and give you best possible fuel economy from 5.5 liter V8. We covered 250 kms in 1.25 fuel tank. Average fuel economy is 4.5 kmpl. A figure of 7-8kmph is achievable, if one can drive just under 3 digit speed on 7th gear. 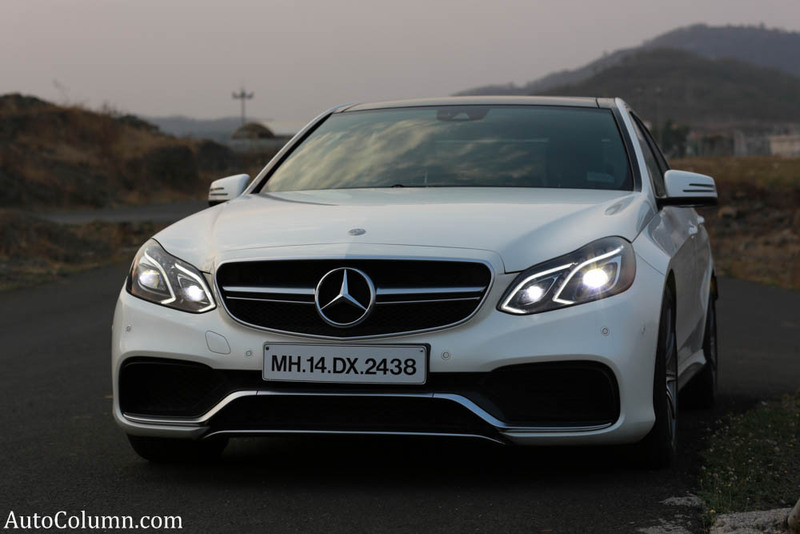 E 63 AMG is equipped with an extremely effective AMG high-performance braking system befitting its status as an AMG automobile. The front and the rear axles sport ventilated and perforated brake disks in ample 360 millimeter format. The disks which are subjected to particularly high levels of stress and strain on the front axle feature the composite braking technology which has been tried and tested in the field of motor sport. Everything that comes in this car is all consideration of motorsport fun at any go of the throttle. The power in this car is so much that the chassis and the brakes are always doing overtime. When we left from Pune city, we put the car in eco mode and the rear passengers were completely comfortable, a little less than E-Class. As soon as we left city and touched highway, the pedal to metal itch and the mighty car tempted us to hit straight road to check top speed. The car reached 250kmph easily a way before the straight patch ended. We are sure if electronic limiter is turned off, this machine can fairly do 300kmph mark. The distance this car disposes is so quick and soon we reached in Lonavala to do a real world handling test on ghats of Amby Valley. 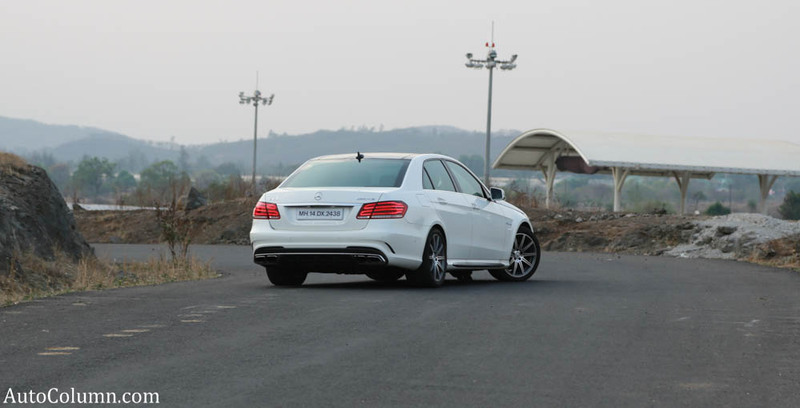 We know that these ghats don’t justify testing its handling but we also drove this car on BIC when launched in 2013. The steering is direct and the car points the nose where the driver wants very precisely. 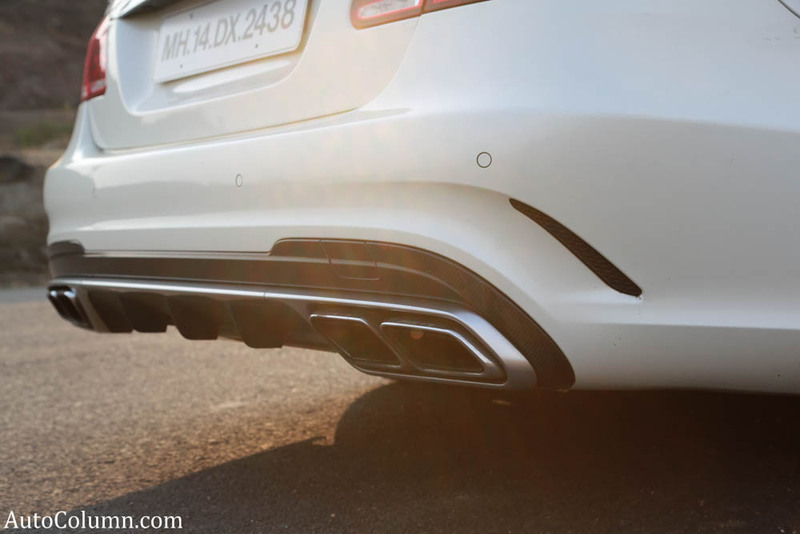 The rear wheels of the car tend to slide the tail due to massive 720 Nm torque scorching tarmac but all electronic systems always actively place this car on perfect lines. This happens when you are on comfort mode. Switch to sports and sports+ mode, the monster awakes and rpm moves up by 500 to ensure quick shift and power without a delay. Sport and Sport+ mode make the suspension stiffer and one can really feel the ride quality difference between switching. The stiffer suspension gives right feedback at steering and this builds up the confedence level of the commander. The car sits low on suspension and hence there is rock solid stability at high speeds. You won’t even know when you are doing 120kmph unless windows are rolled down. The low sitting suspension setup is fantastic for handling and keeping car’s center of gravity low but at the same time this is a problem as far as speedbreakers on our Indian roads are concerned . There is always a scare of scrapping belly of the car and one has to go crossways to avoid scrapping belly. The car looks plain from side profile and purely agressive from front. The sleeker and meaner looks are blended at the same time and so does the car perform. 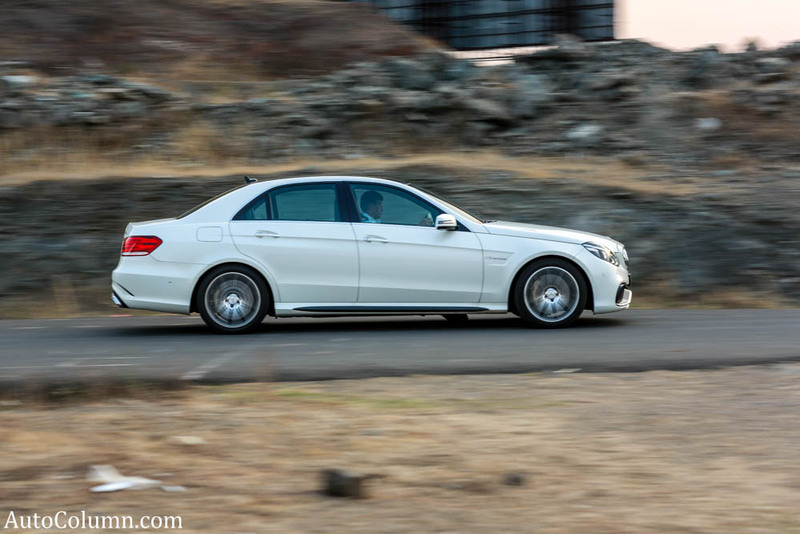 When you don’t want to go to its mosterous mode, it just becomes a regular E-Class but always ready to become angry, one can always feel it as car crosses power band rpm range in any gear. E63 AMG is pure fun to hear V8 biturbo engine grunting all along the travel. The sharp brakes, crazy performance and precise handling make this car right competition for BMW M5. 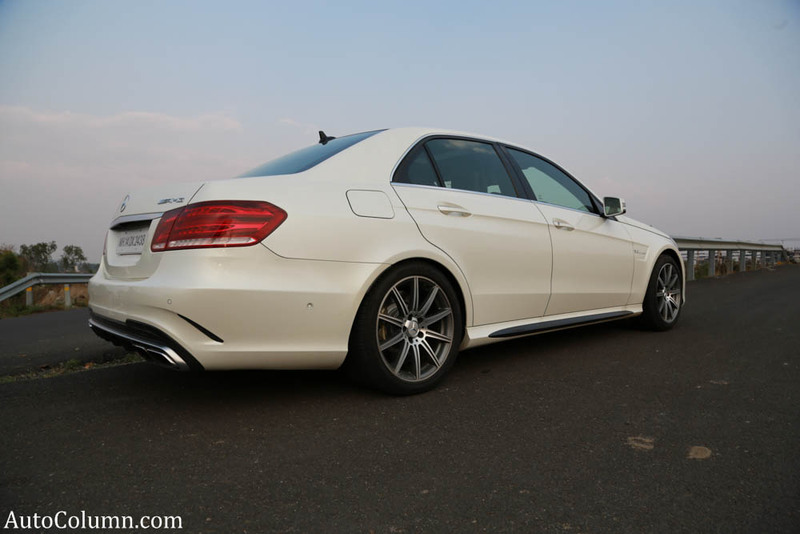 2014 E63 AMG might not look as radical as competition but it has everything to stand at par with them. The car can accomodate 5 people with their luggage and can give experience of race track car in half of Ferrari price.